Pure and natural, from the Catskill Mountains. Catskill Provisions tap over 2000 maple trees in upstate New York to create their syrups, bringing long overdue attention to this underappreciated, sustainable, local resource. 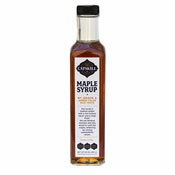 The syrup is heated at 180° - 200° and filtered 12 times through natural paper; this eliminates the "syrup sand" most syrups have, which are generally only filtered 6 times, and increases clarity. 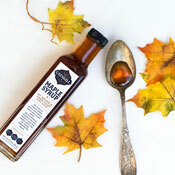 The complex flavour and clean finish of this small batch, hand packed syrup lends itself to pancakes and waffles, but is light-bodied enough to be used as a simple syrup in the kitchen, too!